“When I started 20 years ago in this department, we had 20 people. We shrunk that to 10, and we’re doing as much, if not more, than we did with 20,” Moats says. He cites better training and improved equipment as two key factors for the increased productivity. In August, TUL had its annual FAA Part 139 safety inspection, and for the third year in a row, it came away with zero discrepancies. Moats and his team prepared by checking markings early in the year and compiling a list of which needed work. The airport owns a handheld reflectometer (StripeMaster 2 Touch from RoadVista) to take daytime and nighttime readings of portions of markings. But this year, TUL contracted Sightline Inc., a Virginia-based airport markings consultant, to complete a full, independent assessment. 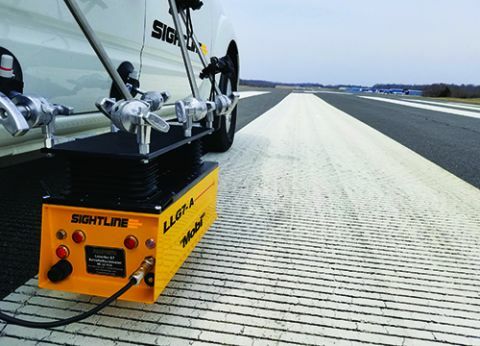 Mike Speidel, Sightline’s vice president, says the company offers more than 50 years of cumulative experience with runway markings—a wealth of knowledge that some airport maintenance teams just don’t have. Speidel’s mother, Donna, founded Speidel Construction in 1981 to paint highway and airfield markings. Eventually, Sightline focused strictly on airports and now only completes assessments. Moats met Speidel when TUL hosted one of Sightline’s first markings symposiums in 2010. The company has conducted more than 30 similar symposiums since. 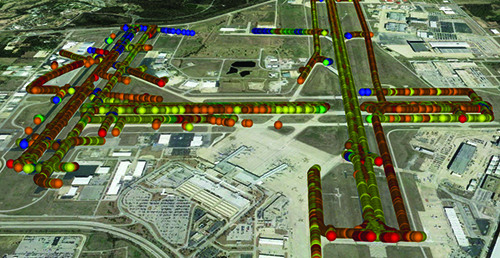 Nearly a decade later, Moats contracted Sightline to perform an independent assessment at TUL, and crews worked for two nights measuring reflectivity. Overall, the company determined that 6% of the airport’s markings required immediate maintenance, 43% would need maintenance in the near future, and the remaining 51% tested between good and excellent. Postponing work on markings that are in good shape can save airports hundreds of thousands of dollars a year, says Speidel. Many airports repaint all of their markings at the same interval (often right before an annual FAA inspection), and crews often paint directly over the old, dirty markings. “It’s a reactive culture that leads to a lot of other problems,” Speidel cautions. Cleaning airfield markings is significantly cheaper than painting them, and may be all that’s needed, he adds. Moats estimates that TUL saves 86% when it can clean rather than repaint. “The bigger the job, the more we save,” he adds. The airport owns a Stripe Hog SK2000 water blaster for cleaning and removing markings. When repainting is required, Speidel says it’s crucial to adequately clean the existing surface so new paint can bond properly. To avoid a potential conflict of interest with its independent markings assessment services, Sightline does not provide painting and maintenance services. Speidel credits Moats for his commitment to learning the best ways to maintain effective markings and adapting TUL’s practices accordingly. “The biggest change is they set out to paint less and clean more. That’s something we’ve been preaching for 10 years,” Speidel says. TUL uses four Graco LineLazer machines to paint markings, including a 200HS with auto layout, which Moats says shaves half the time off striping jobs. The airport’s LineLazer 250DC and 200HS can paint up to a 3-foot-wide line in one pass, and each has the capability to paint two colors at once. Both machines have a pressurized glass bead system that distributes beads more evenly across the lines, says Moats. By using lasers, TUL has eliminated the need to string lines. A long-line laser allows daytime workers to paint a line up to 600 feet at a time, reports Moats. Crews then use a dot laser to double check the straightness or radii accuracy.